Senior AIB bankers, many of whom were responsible for the practices which led to implosion of the Irish banking system, are to receive forty million euro in ‘bonuses’ from the Fianna Fail/Green Party coalition government. And as the government introduced the state’s harshest-ever budget -- openly targeting Ireland’s poor -- it was reported that children in Kilkenny are searching rubbish bins to survive. 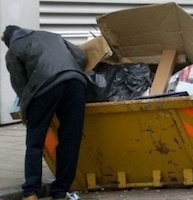 “We are seeing Third World conditions in the city, with two children found rooting through bins in search of food on High Street, said the president of the St Vincent de Paul charity, Liam Heffernan. “I also saw an adult searching through a bin recently for food. I have never seen conditions so bad. People are going hungry and are in desperate need of fuel and there is a real chance that there could be an awful tragedy if people don’t act,” he said. Brendan Dempsey, Cork regional president of the society, said he had seen adults but not children going through bins in Cork city. It was something he had noticed over the last couple of months, but not before. “It’s years since I saw anybody rooting through bins but I do know that families are extremely hard pressed at the moment and there are children going to bed hungry,” he said. “I’ve been in houses where they literally had nothing in the fridge,” he added. These included families where both parents had lost their jobs. John Monaghan, national vice-president of the society, said children were routinely found in houses with no heat or light and little food. Calls for support this year are up by an average of 35 per cent on 2009, and by more than 50 per cent in Cork and more than 40 per cent in Dublin, he said. Meanwhile, the government has been strongly criticised after it said it will issue giant handouts to the former managers of the insolvent and now nationalised AIB bank. The money, described by some critics as ‘hush money’ payments, amount to 17,000 euro each to 2,400 workers. The 99% state-owned bank said it had no choice but to pay out the money it described as ‘bonuses’ for work carried out in 2008, the year it was bailed out by the government. Finance Minister Lenihan claimed he was ‘powerless’ to prevent the payments, but that all future bank bonuses by the state-run banks would be heavily taxed. The Opposition branded Lenihan’s sudden announcement of a 90% levy on bankers’ bonuses an attempt to appease vulnerable people hit hardest by the Budget 2011 welfare cuts. Fine Gael leader Enda Kenny referred to the bonuses as ‘scandalous’. Meanwhile, shares in Irish banks rose sharply on stock exchanges this week following the Budget vote, which affirmed the transfer of billions of euro into the banks’ coffers. New figures published this evening show the Central Bank in Dublin had to pump another ten billion euro into the Irish banking ‘black hole’ last month alone. The latest payment brings the total funding to more than 181 billion euro, or about a quarter of a trillion dollars. Outside the Dail today, state-supported full-time carers, who have endured a second year of sharp cuts to their allowances, protested against the latest 4% reduction. Sinn Fein’s Caoimhghin O Coalain described the cuts as “an absolute He called on Fine Gael and Labour to pledge to reverse what he called a “cruel and savage” Budget. “This Budget has launched a further all-out attack on people dependent on social welfare and the slashing of the minimum wage is to follow next March,” he said. “The result of this cruel Budget will be poverty and unemployment and social misery. The cuts to social welfare are savage and it is people on social welfare who are going to bear the brunt of this Budget. He said Sinn Fein have put forward a fairer, better way to real economic recovery and urged a last-ditch attempt to stop the regressive agenda. “This Budget is still not a done deal. The four-year plan is not a done deal. And the IMF-EU sell-out is not completed either.